Creating events on Ticketor is fast and easy. To add your event use the "Control Panel > Events & Venues > Events" and click on the New Event button. Alternatively, you can click on the Add Event button on your home page. Later on, to edit your event use the "Control Panel > Events & Venues > Events". Find the event in the list, and click on the icon to edit the event. Alternatively, as a shortcut, if the event is showing up on your home page, you can hover your mouse over the event and use the "Edit Event" link. There is a Walk through that pops up and guides you through the steps. Make sure to use it. You can always open the walk-through from the right side of the screen. To complete the event, use the walk-through or continue reading. Enter event details, optionally upload pictures and videos. Select an existing venue or create a new one. Define your pricing structure and charges by creating "price levels" and "price variations"
Please note that venues and seating charts are independent of events and can be reused in as many events. As a result, when creating a venue or seating chart, there is no concept of events or pricing. Event creation page consists of a few tabs. Fill out the information in each tab, save and continue to the next tab to complete the event. Start with entering event's general information such as event name, date, venue etc. General Admission (first-come, first-serve) or Standing: Select this option if you don't want seat numbers on your tickets and your event is either standing, or first-come-first-serve. You can still have different sections and price levels. Venue is where your event happens. If you have already created the venue, you can select it from the list. Otherwise, click on "Create a new venue" and create one. Set the date/time of the event and set the date/time when the system will start and end the ticket sales. Note that all times are based on the venue's local time-zone. So double-check and make sure the venue time-zone is set correctly. At this exact time (based on venues local time-zone) ticket sales will end. It is recommended to set the sales end date to a couple hours after the start of the event so that last-minute buyers can still buy tickets and attend the event, even after it is started. Set the rest of event details and tick the "Active" box to activate it. Here you can select the different delivery methods that you want to offer for this event and specify the event's returns policy. Select the delivery methods that you want to offer. By default, the system comes with 2 delivery methods. Print e-tickets or show on the phone: means that the buyer will either print their tickets or show them on their phone to get admitted. You can add more delivery methods such as different types of mail (post), pick up from a certain location or retail store, ... here. You can even specify a fee for each delivery method. One of the most popular delivery methods is e-Tickets. It is easy and cost effective delivery method. The tickets will be emailed to the user, right after the purchase and they can either print them or show them on the phone to get admitted. 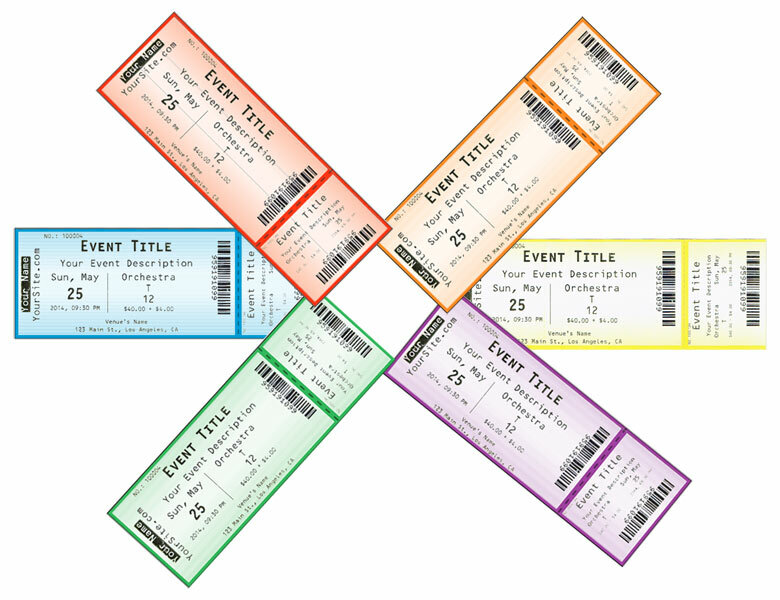 e-Tickets are secured using a hard-to-generate code that is printed on each e-ticket. It is printed in QR code format, barcode format and human readable digits. At the gate, tickets should be validated to make sure they are valid and they are not duplicate (not being used more than once). Check out Control Panel > Help & Support > Help & Instructions > Gate Control & E-Ticket Validation for more information. Another delivery method is will-call where the customer picks up their tickets at a booth at the venue or a designated pick up location before the event. Users who don't have access to printers may choose this option. If will-call is offered as the delivery method, you should be prepared to deliver the will-call tickets. Check out Control Panel > Help & Support > Help & Instructions >Ticket Delivery & Delivery Options for more information. You can also offer delivery by mail. You can consult the post office or any mailing service to find the proper mailing options. You will get an email anytime a customer purchases tickets that require shipping and you are responsible for printing and mailing out the tickets. Check out Control Panel > Help & Support > Help & Instructions >Ticket Delivery & Delivery Options for more information. Specify the event returns policy. Whether or not you accept returns and if you do, for how long before the event and how much you charge for returns. Upload your flyer, picture of the venue/seating chart and add your YouTube or Facebook video. All pictures should be in jpg, gif or png format. Select the e-tickets design and preview a sample e-ticket. Define your pricing structure by creating "Price Levels" And "Price Variations"
If your event is assigned seat and you have not created the seating chart yet, you will be asked to design your seating chart for the venue before you can add tickets. Set some more options and details about your event. If you are selling ticket for another entity (organizer) and you want to give them access to all the sales reports for their event, or even access to create events on your site, you need to introduce them in the system as an organizer and select them as the organizer for the event. Check out Control Panel > Help & Support > Help & Instructions > Users with special permission: Admins, Reports, Organizers, Sales Agents & Gate Controllers on how to add new organizers. If necessary, enter questions that the buyer must answer to buy tickets. Check out Control Panel > Help & Support > Help & Instructions > Question Manager (Asking questions from buyers) on how to create and manage questions. When your event is all set up, you can use the promote tab to send out promotional emails to your mailing list or create track-able links to distribute to your promoters or use in your digital ads. Track-able links, are links to your event or website that is tracked by the system. You can create as many track-able links, just by entering a unique keyword. Anytime somebody uses those links to come to your website and purchases tickets, the system relates that purchase to the keyword so you can report on that. This feature can be used to evaluate the efficiency (ROI) of your different ads or marketing campaigns or to calculate the amount of sales by your sub-promoters. If your event is general admission, you can skip this section. However, if your event or part of the event is assigned seat, you need to create a seating chart for your venue. Go to Control Panel > Events & Venues > Venues. You should see your venue in the list. Click on the icon for the venue to go to the "Seating chart designer" page. There is a Walk-through that pops up and guides you through the steps. Make sure to use it. You can always open the walk-through from the right side of the screen. Use the walk-through or continue reading. The point of creating the interactive seating chart is to allow the buyer to select their seat or table on the interactive seating chart when buying tickets. You probably have the seating chart on paper or in mind. 1- The venue and the seating chart should be re-usable by different events. So when creating the seating chart, do not think about the pricing or colors of the seats. They will be determined at the next step, when you create the event and add tickets to the chart. 2- The point of seating chart is to give the buyer an idea on where they are going to seat. It is not meant to match exactly what you have on paper or what is actually on the ground. 3- All changes to the seating chart are auto-saved. There is no need for explicit saving. 1- Sections: an amphitheater style chart is made of sections that contain rows and each row contains seats. 2- Tables (without seat number): could be in different shapes (round, square, corner) and different sizes (8 person, 10 person, etc.). Buyer can select the table but not individual seats. You should use this option if the seats are not numbered or the seats are not fixed and people may be able to move the seats around. Otherwise, if the seats are fixed and are numbered, use the "tables with seat numbers" instead. 3- General admission sections: Could be a standing area in the venue or a seated area that is based on first-come-first-serve. General admission sections can be used to create general admission sections or areas in an assigned seat event. 4- Tables with seat numbers or individual seats: Are a group of individual seats with an optional shape object (table). You can move around each individual seat or the table itself. You can use them to create scattered seats in the venue or use it with a shape (table) to create tables that the buyer can select individual seats on. Each seat and the optional shape can be moved individually and the shape can be resized. 5- Shapes: Could be used to show other areas of the venue such as the stage, bars, dance floor, etc. You can add any of the above components to your seating chart. Most venues including amphitheaters and arenas consist of "Sections". In such venues, each seat is identified by section name, row name and seat number. If you are designing an amphitheater, it is easier if you rotate your paper seating chart to have the stage at the bottom and then design the chart. After the design is complete, you can rotate the chart. The area with the dotted border is the seating chart designer area. It can expand to the right and bottom as much as you need. So start by adding sections from the top-left and expand to the bottom and right as needed to make sure you don't run out of space. Click anywhere in the area with the dotted border to add an object (Section, General Admission Section, Table or Shape) to your seating chart. After adding an object to the chart, a window pops up and asks about the section properties which may vary based on the object type. Hover your mouse over the icon for more information about each field. What does "Sales Priority" mean? Buyers can select their seat on the seating chart. However, alternatively, they can ask the system to find them the best available seat for the price they have selected. How does the system determine the best available seat? Here is where the sales priority comes to the picture. The system assumes that the sections with lower sales priority are the better sections. Make sure to set the sales priority so that the best sections in the venue have the sales priority of 1 and as you get farther from the stage, the sections get bigger sales priorities. If you add a section, then the next step is to add rows. Click on the 'Add row' link in the section to open the 'Edit Rows' pop up. Important note: Always start by adding the closest row to the stage (usually row A or 1) and then proceed to next rows. After adding the first row in the section, always verify by hovering your mouse over the seats to make sure they are in the correct order and alignment before you proceed with the rest of the rows. Made a mistake in row properties? Or did you miss a row? Click on the row to edit it or insert the missing row below it. Click on the to edit, delete or rotate the section. Have similar sections? Duplicate the section and edit the properties. Duplication is really helpful for table events to create tables at exactly same size. Drag and drop the section to move them around. This step should be done after your seating chart is complete. Using the slider at the top-right, zoom the seating chart in or out to make it best fit on the screen. Also, use the rotate icon to rotate the chart. Hide section details: For larger venues, usually with over 6000 seats, it may look better and work faster to make the seating chart to hide the section details. The buyer clicks on a section and the details (row and seats) open up in a bigger window. Your Seating Chart is Ready! Your seating chart is now ready! Now you can go to the Add/Update Tickets page to add tickets to the chart. After creating your event, you need to define your pricing structure and add tickets for the event. This is done in the "Add/Update Tickets" page. To get to the Add/Update tickets page, use the "Control Panel > Events & Venues > Events". Find the event in the list, and click on the icon. Alternatively, as a shortcut, if the event is showing up on your home page, you can hover your mouse over the event and use the "Add/Update Tickets" link. Add/Update tickets page looks different if you are adding tickets to an assigned seat event vs a general admission event. There is a Walk-through that pops up and guides you through the steps. Make sure to use it. You can always open the walk-through from the right side of the screen. Use the walk-through or continue to the section for your event type. Now that you have created your general admission event, you should define your pricing structure and set the capacity (maximum number of tickets) for each price level. Let's start with understanding 2 concepts. Price variations: Each price level, may have price variations. Price variations share the inventory (capacity) with the price level. For example, your $50 "General" price level, may have a $40 price variation for seniors and a $30 price variation for kids. It may also have a $35 price variation for early-birds that goes away on a certain date or a $30 group pricing where 10 or more tickets are purchased. Another example of the price variation could be "ticket + some additional item". For example, "+ 2 free drinks" or "+ a t-shirt" or "+ back-stage access"
Click on Add/Price Level to open the pop-up to create one. Optionally, enter a name and description for the price level. Examples of the description could be "First-come-first-serve" or "Student id required"
Select a color for the price level. E-tickets will get printed in this color. Face Price: Set the price for this price level. Service Charge: Set the amount or percentage of the service charge. the service charge is the extra amount that the buyer pays for each ticket. It is usually used to cover ticketing and payment processing fees. You are the one who collects and keeps the service charge amount. You have full control to set the service charge to any amount you like. You can set it to zero or any amount. Start / End Date: Price levels can have a start and end date. Normally and by default, they are set to start and end when the ticket sales starts or ends so you can centrally control that from the "Edit Event" page. However, some price levels may make sense to start selling later or end selling earlier. For example, 'Early Bird' tickets may become un-available at a certain date. Note that the price levels also respect the start/end date of the event and the start/end date of the price level must be equal or more limited than the start and end date set for the event otherwise the start and end date for the event will be considered. Capacity: Set the maximum number of tickets you want to sell at this price level. The system will issue tickets up to the specified capacity. Quantity Restrictions: You can specify the minimum, maximum and increment that the tickets can be purchased at. For example, if you are selling tables at a dinner event or night club, you may want to make people buy the whole table. in that case you can set the 'minimum' to 8 (table size). Or if you are selling tickets that are supposed to be purchased in pairs, you may want to set the minimum to 2 and increments to 2 so people can buy 2, or 4 or 6 tickets. This feature can be used to create group tickets, such as family tickets. Save the Price Level to close the pop up. The price level gets added to this table. You can edit it, delete it, or add price variations for it. Edit the Price Level: You can always (even after some tickets are sold), edit the price level, change the prices or colors and edit the start/end date or the quantity restrictions. You can add a Price Variation to the price level. Creating and editing price variations is very similar to price levels and they will show up in the same table. Note that the price variations also respect the start/end date of the price level and the event and the start/end date of the price level must be equal or more limited than the start and end date set for the price level and the event. The table at the bottom, displays the status of the tickets and number of tickets available. Now that you have created your assigned-seat event, you should define your pricing structure and add tickets at a specific price level for each seat. Make sure that your seating chart is complete before adding tickets. Adding tickets to the seating chart will lock certain changes to the seating chart. Price levels: are different prices you have for different areas of the seating chart. If you have 3 different prices, you need to create 3 price levels. Price variations: Each price level, may have price variations. For example, your $50 price level, may have a $40 price variation for seniors and a $30 price variation for kids. It may also have a $35 price variation for early-birds that goes away on a certain date. Another example of the price variation could be "ticket + some additional item". For example, "+ 2 free drinks" or "+ a t-shirt" or "+ back-stage access"
Create only ONE price level per price. For example, if you have $50 seats in orchestra left and orchestra right sections, do NOT create 2 price levels. Examples of the description could be "2 drinks included" or "Student id required"
Quantity Restrictions: You can specify the minimum, maximum and increment that the tickets can be purchased at. For example, if you are selling tables at a dinner event or night club, you may want to make people buy the whole table. in that case you can set the 'minimum' to 8 (table size). Or if you are selling tickets that are supposed to be purchased in pairs, you may want to set the minimum to 2 and increments to 2 so people can buy 2, or 4 or 6 tickets. You can add as many Price Variations to the price level. Creating and editing price variations is very similar to price levels and they will show up in the same table. Please note that editing a price level or variation, will affect all the tickets added at that price level. So if you want to raise the price of ALL $50 tickets to $60, even after the sales has started, you can simply edit the price level. However, to change the price level for some seats you should select those seats and use the "Update Tickets" button. Now that price levels are created, we should add tickets for each seat. Tickets can be added and managed as granular as one ticket at a time, or in bulk as several rows or a full section at a time. There are 2 methods to add, update or delete tickets. Using the top part of the page, you can select a 'Price Level', then select a range of seats and add tickets. To add, update tickets using method 1, first select a price level. Then select the section or table that you want to add tickets for. Then depending on the section type select the row range or seat range. If the tickets are accessible (only allowed to be used by handicaps and their companions), tick the accessible box. Accessible seats will show on the map as blue/white stripes. Blocked seats: Blocked seats cannot be purchased by regular users until you un-blocked them. However, administrators and sales agents with the permission to 'Sell blocked seats' can sell those seats. On the seating chart, blocked seats show as faded out to admin and sales agents, however they show as un-available to regular users. Blocking can be used for several purposes. It can be used to temporarily make some seats un-available or reserve them for a potential buyer or you can block some seats and order physical tickets for them to sell offline in other outlets. Then click on 'Add Tickets' to add those tickets to the seating chart. If all or some of the tickets already exist, you will get an error message and those tickets will not get re-added. You can scroll down and verify the added tickets on the seating chart. If the tickets already exist and you want to change their price level, you should use the 'Update Tickets' button. Or use the 'Delete Tickets' to delete them. To block or unblock tickets, or to change their accessible status, after selecting the seat range, use the "More Actions" menu. Alternatively, you can add, update or delete tickets by clicking on a section, row, seat or table on the seating chart and selecting the proper option from the pop up. Venue is the physical location where your event happens. It usually has a name, address and time zone. If the venue is for an assigned seat event, such as an amphi-theater or a ballroom with round dinner tables, then it also has a seating chart. Venues are reusable. Meaning that many events can use the same venue. You can have as many venues as you need. You can create and manage venues from "Control Panel > Events & Venues > Venues". On this page, you see a list of your venues, and you can create a new venue. In the list, click on the icon to edit the venue, or on the to design the seating chart for assigned seat events. The most important field when creating a venue is the "time zone". All times such as event time, sales start date and sales end date, are based on the venue time zone. You as the administrator can return tickets and refund money anytime regardless of your returns policy. Returning tickets will void the issued tickets, make them available for sell again, refunds customers money and send them a "Return confirmation" email. The money can either be refunded to buyer's credit card or credited to their account as "Store credit". If "Store Credit" is chosen, the specified amount will be credited to the user account and they can use this credit to make purchases on your site. It is a good option when the buyer wants to exchange their tickets. Note: If the tickets were originally purchased through a "Sales Agent" and the tickets are refunded for "Store Credit", the same sales agent (and not the buyer) will receive the store credit. Find the "Invoice" you are looking for by using the filters. You may need to change the from/to date range and hit the Refresh button to see the invoice. Select the proper Invoice by clicking on the icon to see the invoice details. To make full refund and return all the tickets in an invoice, from the "Invoice Actions" menu, select "Void Invoice"
To return some tickets or make partial refund, check the checkbox in the "Return" column for all the tickets that you want to return. A pop up shows up with the return information. You can move the pop up around by dragging the header section of the pop up and check the return checkbox for more tickets to add them to the return list. Select the refund method. You can choose either "Store credit", or "Return to their credit card". The pop up will indicate the return amount. If you are granted the permission to "Give Discount", you will be able to modify the return amount at this point. You can make a "Full Refund" which will refund the ticket face price + the service charge, or you can just return the face price by selecting "Ticket price (not including service charge) " or "Ticket price minus return service charge" which will consider the non-refundable fees and return fees as you specified in the event return policy settings, or you can refund a custom amount just by editing the "Return Price" box. A confirmation email will be sent to the customer confirming the return of tickets. To exchange tickets for a buyer, you have 2 options. Option 1 is to return the tickets for full refund (make sure to include the service charges) to the buyers store credit account and ask the buyer to purchase the tickets using the store credit. They will receive the store credit on the checkout page. Option 2 (shortcut) is to return the original tickets for $0 and purchase the new tickets for them at 100% at $0. Ticketor is a full-featured box-office solution. You can use it to sell tickets online, over the phone or at a retail location, ticket booth or box-office. 1- The user selling the tickets, needs to have "Sales Agent" role, probably with the permission to sell in cash. Check out "Users with special permission" section for more information. 2- You also need a computer or laptop connected to internet. 3- For face-to-face sales, you probably need a printer and optionally a credit card reader. You can use a regular ink-jet or laser printer to print paper tickets, or a professional thermal printer to print professional hard-copy tickets. Check out "Set Up Your Box Office" section for more information about the equipment. Credit card reader is optional. You can manually enter the credit card information using your keyboard, however, a credit card reader speeds up the data entry. There is 2 methods that a sales agent can use to sell tickets over-the-phone or face-to-face. Option 1: Use the "Control Panel > Box-Office > Sales Page" to get to the fast, touch-friendly POS (point of sales) page, where you can quickly select tickets, sell them for cash or credit card and print them out on a thermal or regular printer. If the buyers email address is entered, they will receive the sales confirmation email and e-tickets in email. Option 2: Simply add the proper tickets to your shopping cart, as if you were buying for yourself, and proceed to the checkout page. On the checkout page, enter the buyer's information and their credit card information. If the buyers email address is entered, they will receive the sales confirmation email and if "Print e-tickets" is selected as the delivery method, e-tickets will be included in the confirmation email. If the buyer does not have an email, you can select will-call or mail (post) for the delivery option and they can pick their tickets up or receive them in mail. For face-to-face sales, when you print the tickets right away and hand them in, and that you don't necessarily need buyer's name and email, you can select the "Fast mode - Cash" or "Fast mode - Credit card" to skip extra data entry. Also, set the delivery method to "Direct" to print the tickets and hand them in directly. Check out Control Panel > Help & Support > Help & Instructions > Set Up Your Box Office (Thermal printer, Credit card reader) for detailed information on setting up thermal printers and credit card readers. Ticketor supports all type of delivery methods. By default, the system comes with 2 delivery methods. e-tickets (print or show on your phone): means that the buyer will either print their tickets or show them on their phone to get admitted. However, you can define your own delivery methods and associate fees with them. Delivery methods such as different types of mail (post), pick up from a certain location or retail store, ... .
To create or edit delivery methods use Control Panel > Events & Venues > Delivery Methods. Each event can offer one or more delivery methods. To select delivery methods for an event, edit the event and from the Delivery tab, tick the ones that you want to offer. All you have to do, is to validate or scan those tickets at the gate. Check out Control Panel > Help & Support > Help & Instructions > Gate Control & E-Ticket Validation for more information. Another delivery method is will-call where the customer picks up his tickets at a booth at the venue or a designated pick up location before the event. Users who don't have access to a printer may choose this option. If will-call is offered as the delivery method, you should be prepared to deliver the will-call tickets. You can use the Box Office menu > Ticket Pickup page to find the invoice by confirmation number, email, invoice number or credit card number. When you hit search, a list of invoices that match your criteria will show up in the list. The invoices that are set for will-call and are NOT delivered yet, will have a icon. Clicking on the icon, will print the tickets and mark the invoice as delivered. You can print on a regular paper/printer or you can use thermal printers to print professional tickets. A receipt will be printed with each invoice, which you can have it signed and keep for your records. You can also view/edit the invoice using the icon. On the events date, you can use the Control Panel > Events & Venues > Print Tickets page. Select your event and from the Actions menu, select "Print will-call tickets". Then you can print all will-call tickets, sorted in alphabetic order. You can print on regular paper/printer or you can use thermal printers to print professional tickets. A receipt/header with the buyer's information will be printed with each invoice, which you can have it signed and keep for your records. At this point, you should probably disable the will-call option for the event so more tickets are not sold as will-call. You can also offer delivery by mail. You can consult the post office or any mailing service to find the proper mailing options and the fees. When a ticket is sold that requires shipping, you will get a confirmation email with "(Requires Shipping)" in the subject. However, you should not rely on emails and you should check regularly for the invoices that require shipping. You can use the "Control Panel > Events & Venues > Sales & Invoices" page to see all the recent invoices. Set the date range properly and set the "Shipping" to "Not shipped yet". Then hit the "Refresh" button. The invoices that require shipping (and are not shipped yet) will show up and they will have a icon. Clicking on the icon, will print the tickets and mark the invoice as "shipped". You can print on regular paper/printer or you can use thermal printers to print professional tickets. A header will be printed with each invoice, with the shipping address. You can use the Control Panel > Events & Venues > Print Tickets page. Select your event and from the Actions menu, select "Print mail tickets". Then you can print all mail tickets, sorted in alphabetic order. You can print on regular paper/printer or you can use thermal printers to print professional tickets. By entering a date/time in the "Tickets sold after" field, you can limit the print to invoices issued after a certain date and so you can ship on a regular basis. If you need to change the delivery method of tickets in an invoice, you can edit the invoice and change the delivery methods. Use the "Control Panel > Events & Venues > Sales & Invoices" page to see all the recent invoices. Set the date range properly and use other filter options to find the invoice. Click on icon to edit the invoice. Change the delivery method for each ticket and click on "Update delivery methods". In this section, you will learn about different methods of gate control and ticket validation. Invalid Tickets: Tickets that are generated fraudulently or belong to another event or another performance of this event or they are purchased but later refunded. To achieve this goal, each ticket has a unique, hard-to-generate numeric code. The code is printed on each ticket as human-readable numeric value, right below the barcode. The same code is also printed on tickets, in a machine-readable format, as both a barcode and a QR code. So in other words, the barcode, QR code and the number printed below the barcode, all represent the same code. At the gate, the code should be read from the ticket and validated against a list of all valid codes for the event. If the code exists in the list, the ticket is valid. Then the code should be checked off the list to indicate that this ticket is already used and so it cannot be used by potential duplicates of the same ticket. Besides accuracy, one of the important factors in gate control, is the speed. A good gate control solution, should be able to read the code and validate it as fast as possible to avoid delay in admission. Another concern, if you have more than 1 gate, is the synchronization. It is important that the admission checklists from all the gates be in sync and when you check off a ticket from a list, it is reflected in all other lists at the same time. In the most basic method of the gate control, proper for small events with one gate only, you can print out an admission list from Control Panel > Events & Venues > Admission List, which is a checklist of all valid codes for the event with the buyer name and information. Then read the numeric code on each ticket and find it in the checklist and check the code off the list. You will use either the device camera or an external barcode scanner to read the barcode or the QR code. If you are using an external barcode scanner, the barcode scanner will read the barcode and transmit the numeric code to the device for validation. You can use an Android or IOS device in conjunction with our "Ticketor Gate" app from the Google Play or App Store to read the barcodes or QR codes. In either case, you can either use the device camera or an external barcode scanner. To use the camera, the device must be equipped with a high-quality camera. Using a phone camera as the sole method of scanning is not recommended for larger events since the camera may be slow in focusing and scanning tickets. The quality and speed varies depending on your camera and if the camera supports auto-focus. In using camera, you will experience much faster and more accurate result by scanning the QR codes as opposed to the barcodes. Scan a few tickets before the event to make sure your phone and camera gives you the speed you require. To scan the tickets faster and more professionally, you can use an external barcode scanner. The barcode scanner device will read the barcode or the QR code faster and from a longer distance, then transmits the numeric code to your device using either Bluetooth or USB. If you are using an external barcode scanner, you really don't need high-end devices and can do validation using very affordable low-end Android phones or tablets. Cameras can scan from both the paper tickets and the buyer's phone display. Cameras have much better performance scanning QR codes than barcodes. So always try with a QR code if possible. Most Barcode scanner devices can scan both from the paper tickets and buyer's phone display. Check with the specification if yours can read from the display. If you are using an Android or IOS device, install "Ticketor Gate" app from Google Play or App Store. Alternatively or if you are using any other type of device, download and install the latest version of Google Chrome or Safari (for IOS). Then go to "Control Panel > Events & Venues > Gate Control" or the direct link at: https://www.ticketor.com/gate. In most browsers, the browser will notify you to install the tool as an app in your device or you can go to the browser menu and select the option to add to home screen. The tool will get installed as an app in your device. Note that if you want to scan with the camera, you need the Android/IOS app or you need a compatible browser that allows access to the camera. The recommended browser is Chrome for all systems and Safari for IOS. The app and the gate control web page work similarly. If you are using the app, use Ticketor.com for "Website Address"
Use external barcode scanner: Tap the Barcode text box to activate it (the box should be selected for the barcode scanner to scan properly). Scan the barcode using the connected barcode scanner. The value should appear in the barcode box and validated immediately. You don't need to hit the enter key or touch the screen. Using the camera: Tap the camera icon/tab. Then hold the QR code (preferred) or the barcode in front of the camera. Hold it for a couple second till the camera focuses and scans the barcode. Scanning with one hand: The recommended Bluetooth scanners are designed in a way to easily get attached to the back of the phone. You can use a double tape such as Scotch® Reusable Tapes to attach them to the back of your phone. Ticketor offers two solutions for recurring or similar events. If you have an event that recurs a few times or you have events that are similar, you can create the first event, make sure it is perfectly complete and ready to sell. Then edit the event and from the "Details" tab, duplicate it. A duplicate event gets generated and you can edit it and change the date, time or other details. The duplicate event will be set to "Private" by default so it does not become available to buyers right away. When you are done with the adjustments, un-tick the private box and make the event available to public. Please note that the event and its duplicates will not be connected in any way and any change in one will not affect the other. If you have events that run several times on a schedule, you can make the event recurring and set the schedule on a daily, weekly, monthly or annual basis or you can just add single instances. For example you can create an event that runs every Saturday and Sunday in the summer. If the event does not run on a certain weekend, you can add that weekend as an exclusion. The recurring event shows up on your event-list page as a single event. When the user clicks to buy tickets, they will be taken to the calendar to select the event instance based on the date and time. On the event manager page at "Control Panel > Events & Venues > Events", recurring events are identified by icon. A recurring event, may have 1 or many instances based on the schedule. The instances of the event do not get created right away, instead they get created on-demand when a buyer tries to buy tickets for that instance. On the event manager page, instances of a recurring event are identified by either a (link) icon or (broken link) icon. Normally all the instances are linked to the recurring event and any changes to the recurring event, will reflect in all instances. For example if you change the title or description of the recurring event, all the linked instances will get updated to reflect the same changes. However, if you edit an instance of the recurring event, for example if one of the recurrences are somehow special and you want to reflect that in the title, flyer or pricing, that instance becomes un-linked . From now-on any change in the recurring event, will not update this instance. So you should never edit an instance individually, unless this is a special instance. Note: If you edit the recurring event, all the LINKED instances that have not sold tickets yet, will get deleted and they will get created again on-demand when a buyer tries to buy tickets. Warning: Recurring events feature is so powerful and you can create hundreds of events with few clicks. Be very careful when setting up the schedule and always verify on the calendar to make sure the event dates are correct and that you have not accidentally created extra events. Make sure that holidays and the days you don't have an event on, are properly excluded and that they don't show up on the calendar. After you create events, you can bundle them to create season tickets or packages. A season or package is usually a bundle of 2 or more events that is sometimes sold at a discounted price. To create a package use Control Panel > Events & Venues > Seasons & Packages and create a new package. Fill out the package information and proceed to the "Events" tab. On the events tab, add all the events including in the package. The events may be recurring events. To add any discount for the package, use the "Discount & Options" tab and click on the "Coupon" button which will take you to the coupons page. You can create 1 or more coupons for the package. For example you can create a 10% discount for regular tickets and another 20% discount for VIP tickets. When creating the coupon, set the "Event" to "Specific Package o Season" and select the package by typing a few letters of it. You may ticket the "Automatically apply this coupon on checkout if the conditions meet" the box to make the coupon apply automatically. If the coupon only applies when the buyer purchases all the events in the package or at least certain number of events in the package, make sure to tick the "Must buy all the events that this coupon applies to" box or fill the "Tickets must be for at least X different events" box. Fill out the rest of fields, conditions and restrictions and save the coupon. When the buyer clicks on the package, they will be redirected to the buy tickets page for the package where they can buy tickets to all the events in the package together, or they can buy tickets event-by-event. Important note: The option to buy all the events together only shows up if all the events in the package have exactly similar pricing structure (price levels and price variations) and if the events are assigned seat, they must all use the same venue and seating chart. To make sure the events are similar, try to use event replication when possible. You can create coupons (promotion codes) to give discount to the buyers. To use this feature, use the Control Panel -> Events & Venues -> Coupons and create a new promotion. Event: A promotion may apply to "all events" or "a specific event" or "a specific category (group) of the events". To make the coupon apply to a "specific category", you need to edit each event and in the category box, enter a category name. For example, edit all the desired events and add category "coupon1" to the category. Then in the promotion page, select the "Specific category" option and then enter "coupon1" in the "Event category" box. Promotion code: Enter a unique promotion code in this box. this is the code that the user should enter on the checkout page to get the discount. Automatically apply ...: If this check box is ticked, the coupon will automatically apply to all eligible purchases without the buyer entering the promotion code. This feature is useful in scenarios such as group pricing, where you give a certain discount to bigger groups or to create packages where the price is discounted when the buyer purchases all the events in the category. Promotion type: Select the promotion type that best meets your requirements. If the "amount" or "percent" is selected, enter the amount or percentage. Date range: Fill out the date range that the coupon is valid. Must buy all the events that this coupon applies to: This option is mostly useful if the coupon applies to a category of the events and can be used to give discount if the buyer purchases all the events in the category. It can be used to create packages or seasonal prices. Maximum number of usage: You can specify how many times a coupon can be used by all the buyers. For example, you can create a coupon that works only for the first 10 buyers. Or you can create a coupon that can be used only once. You can create questions to be asked from the buyer on the checkout page. Questions can be related to a specific event and be asked only from the buyers who buy that event (event questions) or can be general and be asked from all buyers (site questions). Event questions can be either asked per ticket or per invoice. Example of event questions for a dinner event could be: What option do you prefer for dinner? Meet/Chicken/Fish/Vegetables. This question should be asked "per ticket" as each attendee may have different dinner preference. Example of site questions could be: How did you hear about our site? or What type of events do you prefer to attend. Asking unnecessary questions during purchase may cause the buyer to abandon the sales and may result in business loss. Only ask questions if they are really necessary and they give value to the buyer. To create questions (both site and event) use Control Panel -> Account & Settings -> Question manager. This page is like your question bank. You will create and manage all type of questions here and later associate them with events or the site. Enter the question, type of answer, and (optionally) a default value and specify if the answer is required. If answer required is ticked, the buyer cannot complete the purchase unless they answer the question or tick the check box. After you create the questions, you can apply them to the whole site or specific events. The answer to the questions will be available in each individual invoice that can be accessed from Control Panel -> Events & Venues -> Sales & Invoices and will also be included in the confirmation email you receive. You may have sub-promoters who promote your events and may get paid based on their sales amount. Or you may advertise on different media (such as Facebook, Twitter, Google, etc.) or run different digital ads and want to track the return of investment (ROI) for each ad or platform. Ticketor allows you to create as many "track-able links" for each event or for your website and use the links in your digital ads or give it away to sub-promoters. When a buyer clicks on the link to come to your site and purchases tickets, the purchase will be tracked back to the link and will get associated to the "referrer". Later on, you can pull sales reports based on the referrer. To create a track-able link for an event, edit the event and go to the "Promote" tab > Track-able links area. Put in a tracking name which could be the name or nickname of a sub-promoter or a code to distinguish the media or Ad. Click on the "Generate link" and copy the generated link. Event statement: Use the Control Panel > Events & Venues > Event Statement > Report type: Sales by origin, to get the total amount of sales, broken down by referrer. In case you need more analytics and tracking information, you can integrate with Google Analytics. Check out the Control Panel > Help & Support > Help & Instructions > Google Analytics Integration for more information. You can send out emails to the customers that opt-in your mailing list. To use this feature login to your website as admin and go to Control Panel -> Events & Venues -> Mailing List . Emails can be in the form of newsletters, promotional or information. You can send the emails to all your customers or only the customers who have purchased tickets to a specific event. You can create templates for emails that you send out frequently. For example, you can have a template for your weekly newsletter that lists all your upcoming events. You can use special variables in the form of [...] in your email templates. These variables will be replaced with the customer or event's information. You can get the complete list of valid variables and an example on how to use them on the mailing list page. You can use html or text in your emails. Always preview your email and send a copy to yourself to make sure everything is as expected before sending out to your customers. If you are using html in your email, always send it to yourself first and make sure it looks good in popular email readers like Gmail, Yahoo, Msn, outlook, etc. You are not allowed to spam customers. At the bottom of each sent email, there is a link that allows your customer to opt-out (unsubscribe) from your mailing list and not get any more emails from you. To prevent the recipients from opting-out and to avoid being marked as spammer by email providers, make sure to always send related and useful email and avoid frequent emails. To avoid spamming, you are limited to at most 2 emails to your mailing list in each week. Try to keep it to minimum. Ticketor offers a variety of real-time reports that can give you all the information you may need regarding your sales, delivery, financial, etc.. Just login to your site and use the "Reports" section of the Control Panel. Each report may offer some filters such as date range, event or user. Set the filters properly and hit the refresh button to update the results. If you need to print the report, just use your browser's "Print" button. Some reports have "Export" options to export the result in Excel. The date/times in the reports, respect the time zone specifies in your Site Settings. Go to "Control Panel > Account & Settings > Site Settings" and make sure your time zone is set correctly. Administrator: Administrator is usually the owner of the site and has the highest level of access. The person who creates the website initially is granted the Administrator role but he can add other people as administrators. Reporter: Has access to all reports without being able to make any changes. Sales Agents: Is a user who can sell tickets to other people. They are usually your staff, who sell tickets over the phone or at the box-office. Sales agents may also be external agents or retail stores who will sell your tickets. Sales Agents can have extra permissions such as ability to "Give Discount", "Issue Refunds" or "Sell in Cash". Sales agents normally only have access to manage the invoices issued by them, which is good for external sales agents. However, for internal sales agents, you can grant them permission to access and manage all invoices. Gate Controller: Is a user who can login and operate the gate control application. Each ticket checker with a barcode scanner, needs to be a "Gate Controller". The user should sign up on your website (not on Ticketor.com) as a regular user. It is recommended that users with elevated permissions, sign up with more secure passwords. An administrator should login to the system. Search the user by name or email and hit the search button. Click on the link to edit the user. From the "Roles & Permissions" tab, check the proper checkboxes. To make a user an administrator, click on the "Invite user to become an administrator" link. If the sales agent user is a "Retail Store" with a physical address, then fill out the business name, website and address fields so that it shows up on the "Store Locator" page. Death, injury, or illness happening to you, or a member of your immediate family. Adverse weather including snow, frost, fog or storm where the Police or Government have issued travel warnings. The mechanical breakdown, accident, fire or theft en route of a private vehicle taking you to the booked event. Refund protection is offered through "Booking Protect", an independent, 3rd party company. All claims and refunds should be processed directly and solely through Booking Protect. Ticketor or your company are not involved and shall not be hold responsible in the refund protection process. What does Booking Protect refunds? Booking protect refunds the total price of purchased tickets, including all service fees and charges, if the buyer cannot attend the event due to certain unforeseen situations when the tickets are non-refundable and not qualified for refund from you. Booking protect only covers tickets and the fees are calculated based on tickets only. "Merchandise" purchased from your online store (if any) are not covered. Please read the: Booking Protect's Terms and Conditions. Shall I Offer Refund Protection? Refund protection is included for free for eligible Ticketor clients, however, you can optionally disable this feature. If you want to disable the feature, you can simply disable it from "Control Panel > Account & Settings > Site Settings > Options", however, it is recommended to offer the service especially if you do not offer a good return policy. Unexpected circumstances happen and buyers miss the events. Regardless of what your return policy specifies, some buyers will call and ask for a refund. Offering refund protection reduces the chance of such situations and unhappy customers. On the checkout page, the buyer receives the option and information to purchase refund protection for certain fee. If the buyer chooses that option, the fee gets added to their total invoice amount. The total amount including the refund protection fee, gets collected through your payment processor, by you. The buyer receives a confirmation for the purchase of the refund protection. You are responsible to pay the full collected refund protection fee to Ticketor, which in turn, will pay the refund protection provider. The refund protection fee, will be billed to you by Ticketor and paid to the service provider. If you are using a payment processor that deducts the fees from each transaction, refund protection fees will also get deducted from each transaction, otherwise you will see a new row on your bills for the refund protection fee, which is already collected by you. In case the buyer needs to get a refund, they should directly file a claim on the "Booking Protect" website and provide the required documents. BookingProtect is solely responsible and in charge of refunds and claims. Ticketor or your company is not involved in the process and shall not be held responsible. The purchase protection fees are non-refundable. Keep that in mind when you are making a refund. Never refund the purchase protection fee. You should activate refund protection for your buyers from Control Panel > Account & Settings > Site Settings > Options and you can change your preference at any time. If you cannot see the option to enable refund protection on Control Panel > Account & Settings > Site Settings > Options, it means that your website is not eligible for refund protection. To request the feature, please contact us. Reviews help your business grow and get more customers. It is an essential part and asset of any business. It also allows your customers to voice their satisfactions or dissatisfactions and so improve your overall performance. In the technology era, reviews are not optional anymore. Customers can review any business on public sites like Google and Yelp, regardless of whether the business approves that or not. While most free review systems like Google or Yelp allow reviews from non-customers and potentially fake or hostile individuals, and offer no way for the business to dispute a fake or hostile review, Ticketor allows review only from verified buyers. By offering Ticketor's review system, you provide a way for your customers to provide their feedback and have their voice heard and so reducing the chance of them reaching out to public review sites that you have no control over. While good reviews help grow your business, bad reviews can hurt the business. The rule of thumb in resolving a bad review is to try to contact the reviewer and resolve the issue. Unlike with other review sites where the reviewer is unknown or may be fake, reviewers on Ticketor are your real customers and so you have access to their contact information. We understand that some reviewers are unreasonable and unfair and not willing to resolve the issue. To make the system fair to the business, you have the option to delete the unfair review permanently. While Ticketor's Review system is free, deleting a review comes at a fee. The fee is there to ensure that the reviews are as honest and fair as possible. The review system is free and you can opt in or out at any time from "Control Panel > Account & Settings > Site Settings > Reviews"
The fee for deleting a review starts at $35 for the first review that gets deleted in a year, and goes up by $20 for any subsequent review that gets deleted in the one year interval. Enhanced Reviews is available for a small monthly fee and it gives you a 2-week window to approve each new or updated review, before they become publicly available. If you approve the review, it will become publicly available right away. Otherwise, you have 2 weeks to contact the reviewer and resolve the bad review or delete the review. Enhanced reviews, make sure you get a chance to deal with any potential bad review, before it becomes available to the public. What should I do if my event is cancelled? Most organizers inform the buyers of the event cancellation as soon as it happens and let them know that they are going to be refunded in few days. This will reduce the chance of any possible credit card dispute or charge-back. Edit the event and set the "sales end date" to the past so the sales will stop. You may want to also update the title and add "Cancelled" to the title. Also, you can explain the cancellation reason and when the buyers can expect a refund in the event description or title. To send an email, simply use the Control Panel -> Events & Venues -> Mailing list and send an email to all the people who purchases tickets to that specific event, explain the cancellation and when and how they are going to get refunds. To void or refund the invoices follow the instruction in Control Panel > Help & Support > Help & Instructions > Returning or Exchanging Tickets / Voiding Invoices. Credit card refunds will show up on the buyer statement in a few days. So, you may want to ask the buyers to be patient and wait a couple days to see the refund. Simply go to Control Panel > Account & Settings > Payment Processor, then click on the blue "Connect or get a Stripe Account". It will take you to Stripe.com. Fill out the form and as soon as you are done, you will be ready to charge credit cards and accept payments. It shouldn't take more than few minutes. Sign up for a Stripe account here. As soon as you fill out the form, your account is created and it will redirect you back to your Ticketor site. And you are now ready to accept credit cards! A credit card logo will appear at the bottom of all your pages. Sign up for a Braintree account here. When the sign up is complete and your account is created, go to Control Panel > Account & Settings > Payment Processor, fill out the form using the values from Braintree site. All the fields are case-sensitive. Make sure to copy/paste accurately. Save and test the integration by making a purchase. When you are done with your Authorize.net account setup, follow their instruction to get the "API Login Id" and the "Transaction Key". Go to Control Panel -> Account & Settings -> Payment Processor. Select Authorize.net and fill out the "API Login Id" and the "Transaction Key" with values from your gateway account. If your payment processor accepts American Express and/or Discover, check the proper checkboxes. Make sure to turn off the TEST MODE on your gateway account otherwise the purchases will go through on your site while the money is not collected! If you already have a PayPal Pro account, you may need to contact PayPal to make sure it comes with PayFlow, otherwise ask them to add PayFlow to your account for free. To get a PayPal Advanced or PayPal Pro account. Go to "Service Settings" > "Hosted Checkout Pages" > "Setup"
Change the "Transaction Process Mode" from "Test" to "Live"
Note: If you don't want to use your manager.paypal.com username/password, you can instead login to manager.paypal.com and create a new user with API access and use the Username/Password for that user. On the other side, PayPal gives extra security to the user as PayPal will not share the credit card information with the website owner or merchant (you) and hence an informed internet users may prefer to use this option for better security. Go to Control Panel -> Account & Settings -> PayPal. You need to fill out the 3 API fields. Note that they are NOT the username and password that you use to login to PayPal. Click on the "Get API Credentials" button. It opens a new page on PayPal. Log in to your PayPal business account. You will see the API values there. If your PayPal account is a "personal" account, upgrade the account to business account for free. Go to your "Profile and Settings" page of your PayPal account. If you haven't already done so, you need to verify your account before requesting API credentials. Click Request API Signature under Option 1. Click Agree and Submit now you should be able to see the API username, password, and signature. Fill out the 3 fields with values from your PayPal account. You need to copy and paste the values accurately as they are long and case sensitive. Make sure to copy the whole line. Some are very long and you need to scroll to get the complete value. Also, make sure not to copy and SPACE at the beginning or end. Hit the "Validate API Credentials". If you get an error, you need to verify the 3 values and try again. Hit the "Save" button. A PayPal logo will appear at the bottom of all your pages. Your Ticketor site initially has an address like Ticketor.com/[YourName]. Assuming that you own a domain like MyDomain.com, you can move the site to this address and make the site more customized (white-label). To do so, you need a Premium account. You need to login to your domain control panel from the company you registered your domain with (for example, GoDaddy), and change your NAMESERVERS to point to NS1.Ticketor.com and NS2.Ticketor.com. Make sure to remove the old values (replace the old values). You can test your settings right after your NS records are updated. Go to: MXtoolboxEnter your domain or subdomain there and hit "DNS Check". You should ns1.ticketor.com and ns2.ticketor.com in the result. Make sure there is no other nameservers besides the Ticketor ones. After the move is finalized you will access your site on your own domain or sub-domain. All outgoing emails such as sales confirmation, welcome email and newsletters will go out from one of the below addresses from your domain/sub-domain. Also, you will be able to receive emails at the below addresses. All emails sent to these addresses will get forwarded to your administrator(s) email addresses. Check out Control Panel > Help & Support > Help & Instructions > Use Your Ticketor Email Address(es) for more information on sending and receiving emails. Do not use "a" records or CNAME records. Ticketor needs to also manage the incoming and outgoing emails. Do not hardcode Ticketor IPs. They may change at any time without notice and your site will become unavailable. Do not forward your domain with masking. Masking will keep your domain name in the browser but it will cause the user to not see the https (secure) sign in the address bar and so not feel secure to put in their credit card information. It may also cause confusion for the user or may break some functionalities such as PayPal payment. You can use it as a stand-alone website and even use it as your official website. If you do not have a website or are not happy with your website, we recommend you consider Ticketor as your official website. Ticketor has many powerful features to build a complete website. You can even move it to your own domain or sub-domain. Check out Control Panel > Help & Support > Help & Instructions > Moving the site to your own domain / sub-domain (white-label) for more information. However, if using Ticketor for your whole website is not an option, you can use either of the following 3 options (or maybe all of them) that allows you to integrate ticketing into your website and add a ticketing section to it. Link exchange is an easy way to make your website and your Ticketor box-office website integrated and seamless at minimum effort. You can pick and choose what pages to use from Ticketor and what pages from your website. Create the Nav on your site. Use Control Panel > Account & Settings > Pages & navigation to create the same navigation menu on your Ticketor site. For items in the nav that point to the other website, use the "Link to other sites" from the drop down. Using a similar nav on both websites, users can navigate back and forth between the 2 sites without actually noticing that. Optionally, links from different places of your website to Ticketor. You may have links like: "Buy Tickets" that points to the buy tickets page for a specific event or all your events, "Event Information", "Returns policy", etc. can point from your other website to Ticketor. To get the URL (address) of any page, simply go to the page and copy the address from your browser. And for each event, Ticketor builds 2 pages. One is the event information page and one is the purchase tickets page. You can get each link by simply going to the page and coping the URL from your browser. You can also insert (embed) any section of your Ticketor site into a page on your other site using IFrames. To do so, simply go to the page on your Ticketor site that you want to embed in your other site. Some potential options are list of all events, or the ticketing page for a specific event. Go to the page that you want to use. Warning: Embedding must be done with cautions. The quality of the embedded content is affected by the quality of the page that you embed the code in. The embedded iframe can grow or shrink in height depending on the content inside the iframe. Make sure to insert the code inside an element that is not restricted in height and can grow freely otherwise it will end up with double scrollbars and will not function properly. Make sure your page is fully responsive and mobile-friendly. If your page is not responsive, the embedded code will not be responsive either. Avoid extra margins or paddings on mobile. The embedded area should be able to take the whole width and height of the screen on small mobile devices. Always set the links to open "in the parent window" to avoid issues from your website to affect the purchase process. If you decide to set the links to open in the same iframe, make sure to fully test the site and purchase flow on different devices and mobile to make sure your parent page is not breaking the purchase process. Users need more features than just purchasing tickets. They may need to login to print or manage their tickets at a later time, or may need to manage their email subscription, cookie preference, password reset, and many more. Make sure your embed solution does not hide this functionality. Integrating your website with social media and Facebook allows you to leverage the power of them to reach to more customers for free. Click on "Import Facebook Pages". It will open a Facebook dialog and you should confirm the requested permissions. Go back to the Control Panel -> Account & Settings -> Site Settings -> Facebook page and select your page in the "Facebook Page" box and hit Save. To add a ticketing tab to your Facebook page, similar to the one on Ticketor's Facebook page, click on "Add ticketing to your Facebook page" button. Facebook requires that the page must have at least 2000 likes to be qualified to add a tab. Your Facebook integration is now complete and your account is connected to Facebook. Google Analytics gives you detailed analytics and stats of your website's traffic. If you want to improve your website traffic, first you should have a good insight of its current state and should be able to monitor the growth or changes. Google Analytics gives you valuable information about users who visited your site. From what country/city they area? What demographic? From what website, did they get to your site? What keywords did they search to find your site? And many more valuable information. You will need to register for Google Analytics (free) to make use of this feature. Click on "A Single Domain" and click save again. Open your site in a new window, login as admin and go to Control Panel -> Account & Settings -> Site Settings and click on Google Analytics tab. In a few hours, you will be able to get reports by logging in to your Google Analytics account. This section explains how you can setup your box-office or retail location. Purchase a compatible credit card reader from Ticketor's store or contact us for a list of compatible scanners. Connect the credit card reader to a USB port in your computer. Test: Open a text editing software, click inside the text box to make that the active window, swipe a credit card. If the data shows up in your text editor, it means that you are all set to go. On the checkout page, click on the "Swipe Credit Card" icon and then swipe the credit card in either direction to fill out the related field. As you sign up with Ticketor, you will get 1 or more email addresses depending on whether you are using Ticketor.com as the domain name or if you are using your own domain or sub-domain name. Ticketor will never expose your personal email address. All outgoing emails such as sales confirmations, welcome and newsletter, will go out from one of the above email addresses. Similarly, all incoming email addresses and replies to the outgoing emails, will be received and forwarded to your administrator(s) personal email address(es). Any Email sent to these email addresses will be sent to your Administrator(s) email address(es). All administrators will receive a copy of the email in their personal email address, the one that they use to sign in. To send Emails or respond to emails from your Ticketor email address(es), you can use your existing personal email provider (Yahoo, Gmail, Hotmail, etc.). All you need to do is to add your Ticketor email address(es) as an "Account" or "Mailbox" or "Send mail as" account. Go to "Settings" page and then go to "Write email" tab. Enter your Ticketor email address in "Add send-only address" box and click "Verify". A confirmation email will be sent to that email address and received in your Yahoo email. Click on the link in the confirmation email and the account is added. Next time when you want to send out an email, you have the option to choose the "From Address". Contact us and ask for your "SMTP Username and Password". Go to "Settings" page and then go to "Accounts and Imports" tab. In the "Send mail as:" section click on "Add another email address you own". Enter the email address and give it a name and click on "Next Step". Then fill out the SMPT server = smtp.sendgrid.com, username = apikey and password = (ask us your password). A confirmation email will be sent to that email address and received in your Gmail email. Click on the link in the confirmation email and the account is added. Next time when you want to send out an email, you have the option to choose the "From Address". Go to "Settings" menu > "Options" page and then go to "Connected Accounts" tab. Click on "Manage or choose a primary alias" link. Select the "Add an existing email address as a Microsoft account alias" and enter your Ticketor email address and click on "Add Alias". A confirmation email will be sent to that email address and received in your Hotmail/Outlook email. Click on the link in the confirmation email and the account is added. Next time when you want to send out an email, you have the option to choose the "From Address". Other providers have very similar way of adding a sending account as Yahoo and Gmail. You can follow similar instruction to add the sending account or you can Google the instruction for your specific provider. Note: You may need to sign out and back in for the new "from address" to appear. Since you are selling tickets online, you probably don't need traditional physical printed tickets. Most people will buy online and either print their tickets at home or just show them on their phone. You can even use the same approach for your retail locations and over-the-phone sales. Check out Control Panel > Help & Support > Help & Instructions > Sell tickets over the phone or face-to-face at a retail location or the box-office for more information. You can either purchase a thermal ticket printer and ticket stocks from Ticketor's store and print hard tickets by yourself or order tickets so we print and ship to you.. Create 1 or more price levels, specifically for print. For each price level, set the "End sale" date to the past so that those tickets do not sell online. Add as many tickets you need to be printed to each price level. The tickets should show as expired since you have set the sales end date to the past and so they will not show up on your ticket sales page. Send us an email from "Control Panel > Help & Support > Contact Ticketor" page and mention the event name, the price levels that you want to print and the color for each price level as well as your shipping address. You can either order all tickets to be printed or only seats that you have blocked. If you order all tickets, you should be extremely careful to not double-sell the seats as each seat is available both online and through the hard tickets. To only print the blocked seats go to Add/Update tickets page and block all seats that needs to be printed. You can block seat-by-seat or several rows at a time or a whole section at a time. Send us an email from "Control Panel > Help & Support > Contact Ticketor" page and mention the event name, whether you want to print all tickets or just the blocked seats, whether you want to print all tickets in one color (specify the color) or you want each ticket to be printed with the same color specified in the price level. Also we need your shipping address. When we receive your request, we send you an invoice that you can pay online. When the invoice is paid, we print one ticket and email you for approval. Upon your approval, the tickets will be printed and ship to your shipping address. We usually print tickets in 2 to 3 business days but you can confirm with us for accurate delivery time. $9.00 shipping. 2 to 3 business days shipping in US. $25.00 (optional) expedite print and ship. Next day shipping. Confirm for availability. Ticketor is essentially a self-service product. It has intuitive design that you can just start using, or you can use the various walk-throughs or you can go through the step-by-step instructions or watch tutorial videos. We have made it easy so that anybody, without computer knowledge, can build and manage a ticketing portal and sell tickets. We also provide customer support through chat and email to make sure you can easily use the site. However, we understand that some people may not have enough time to go through instructions or may simply need somebody to help them out with initial setup or walk them through each step or just need to talk to somebody over the phone. Ticketor can assist with those requests for a fee. At the meeting time, you should be available at your computer or laptop (not a phone or tablet) and connected to internet. They will connect to your computer and while you are watching or actually taking actions on the site, they will help you accomplish what you need to do or teach you how to do stuff or answer your questions. We charge an hourly rate of $50.00 with a minimum of 1 hour. The first hour should be paid before the section. What can you accomplish or learn in a section? Your agent can help you answer any question about the site or help with setting up the site, an event, a venue, a seating chart and can show you how to design your site, integrate it with your website. Also, they can help with the whole process, ticket validation, setting up a box-office, etc. Your agent can NOT help with your business and they cannot offer financial or legal advice however they may share their personal opinion. What would a section look like? So, let's assume you have just signed up and need assistant setting up your site and an event. Your support agent will connect to your computer and can start with setting up the event. They will explain to you what they are doing and may ask you to do the work as they walk you through it so you can learn and do it independently next time. Then they can walk you through getting or integrating a payment processor. And may help you choose some design for your site, upload a logo and background image. Please make sure to have all material such as logo, background image, seating chart, pricing structure, etc. handy. The information in this page and through-out Ticketor are not legal advices and should not be relied on as legal advice. Privacy laws and the GDPR are complex regulation and may require certain actions from the Site Owner. We recommend that you seek legal advice in that regards. You Ticketor site comes by default with such policies, however, it is important to note that these policies are just for illustration and should not be relied on. It may not meet your local law requirement. Make sure to review and if necessary update or replace them. You can consult an attorney or use many online resources to obtain policies that meet your applicable law requirement. Opt in vs opt out for newsletter membership: When a user signs up on your site or buys tickets, they are provided with the option to join your mailing list. The method they are provided to select their preference to join the mailing list could be either "opt-in" or "opt-out". While the opt-out method may end up in more news-letters members, some privacy laws including GDPR may require the opt-in method (explicit consent). You can set the method of consent in "Control Panel > Account & Settings > Site Settings > Options tab"
Third-party integration: Using Ticketor, you can integrate with several third-party providers including payment processors, social networks, Facebook, Google Analytics, Google Ads, Facebook Pixels, refund protection, etc. Make sure that the third-parties that you use comply with and meet your local and applicable laws requirement. Additional data collection: You may use the question manager or other mechanisms built in Ticketor to ask additional questions from your consumers. Make sure your questions and the additional information you collect comply with your local laws. Right-to-access: Ticketor believes in transparency. Your users can access and review their personal information at any time by logging in to their account. The "My Account" and "Order History" menu at the top of the page should allow them to access all the information Ticketor collected about them. Administrators can also access and update users’ personal information from "Control Panel > Account & Settings > User Manager". However, if you need assistance with accessing the information, please contact us. Right-to-update information and change consents: Your users can always log in to their account and from the "My Account" menu update their personal information including their email address, name and phone number and they can remove their mailing list consent or change their preference. Users can also unsubscribe from your mailing list by clicking on the unsubscribe link at the bottom of the emails they receive. Note that all emails sent through the mailing list on your site include an unsubscribe link in the footer. Administrators can also access and update users’ personal information from "Control Panel > Account & Settings > User Manager". However, if you need assistance with updating information, please contact us. Right to be forgotten: You can delete a user’s personally identifiable information from "Control Panel > Account & Settings > User Manager". The entire user’s personal information will get deleted from the system.